Come on the Amazing Journey and learn all you should know." "How can we understand the outside world without first mastering the inside world?" Game I Core Wave: "The primary distinction between inside and outside." Becomes part of the machine. How can he be saved?" "Listening to you I get the music. I get excitement at your feet! On you I see the glory. From you I get the story. And no one had the guts to leave the temple! And I'm waiting for you to follow me." Needed to remove his inner block. Go to the mirror, boy! I often wonder what he is feeling. Has he ever heard a word I've said? Look at him in the mirror, dreaming. What is happening in his head? Gazing at you, I get the heat. Following you, I climb the mountain. I get excitement at your feet! On you, I see the glory. From you, I get the story. 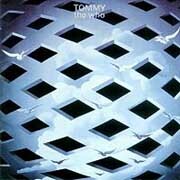 Tommy is an excellent example of the distinctions between inside and outside. While lost "in a quiet vibration land" this deaf, dumb and blind child manages to see himself in a mirror. But he is unable to respond to anything else. Through his infinite contact with himself he becomes a fully-realized person while still cut off from society as a whole. Once his mother breaks the mirror he sets out on a journey as a new messiah, attempting to lead others down the same path to enlightenment. (The movie sucked, though. Listen to the music. I think that one of the keys to understanding "Tommy" is that you can see your own reflection in a pinball. The ball becomes a metaphor for the self as it is bounced around from bumpers to pins and back. Our control of the fate of the ball/self is limited to the flippers and small movements that we can induce in the machine as long as we don't "tilt" or "drain." The body is the Bhodi-tree. And let not dust collect upon it. Nor stand of mirror bright. added as a follow up to Tommy -- R.C. C.- G.M. Game One.